"When the photographer Tiina Itkonen first visited Greenland in 1995, no one spoke of melting icebergs and receding sea ice. Tiina's focus was on the indigenous Inuit and Inughuit cultures and the impossible hues of an endless landscape. 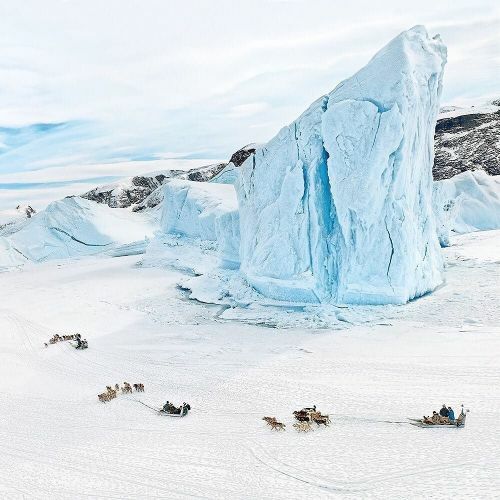 After a decade, though, she shifted her attention to communities in western Greenland with shrinking icebergs, Ilulissat and Uummannaq, where she took this photo of children from the Uummannaq Children's Home riding on dogsleds in 2007. These days, it's hard for Tiina to discuss her experiences in Greenland without acknowledging the changes wrought by global warming. Visit the link in our profile to see more of Tiina Itkonen's photos from Greenland on the @nytimes #lensblog." By nytimes on Instagram.